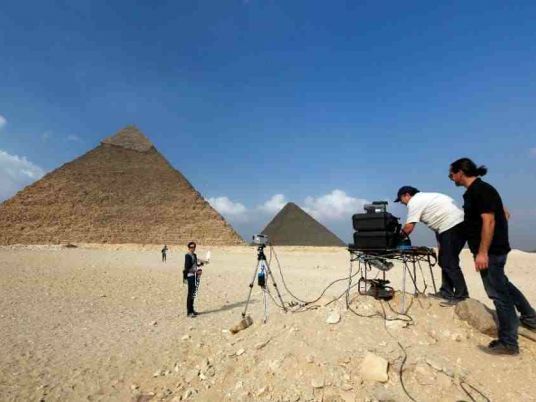 Egypt's Great Pyramid of Giza could contain two previously unknown "cavities", scientists using radiography to scan the millennia-old monument said on Saturday. On Thursday, the antiquities ministry cautiously announced finding "two anomalies" in the pyramid built 4,500 years ago under King Khufu, with further tests to determine their function, nature and size. At 146 metres (480 feet) tall, Khufu pyramid, named after the son of pharaoh Snefru, is considered one of the seven wonders of the ancient world. It has three known chambers, and like other pyramids in Egypt was intended as a pharaoh's tomb. "We are now able to confirm the existence of a 'void' hidden behind the north face, that could have the form of at least one corridor going inside the Great Pyramid," scientists from Operation ScanPyramids said in a statement. Another "cavity" was discovered on the pyramid's northeast flank, said the researchers who are using radiography and 3D reconstruction for their study. Operation ScanPyramids began in October last year to search for hidden rooms inside Khufu and its neighbour Khafre in Giza, as well as the Bent and Red pyramids in Dahshur, all south of Cairo. The project applies a mix of infrared thermography, muon radiography imaging and 3D reconstruction — all of which the researchers say are non-invasive and non-destructive techniques. Muons are "similar to X-rays which can penetrate the body and allow bone imaging" and "can go through hundreds of meters of stone before being absorbed," ScanPyramids explained in a statement. "Judiciously placed detectors — for example inside a pyramid, below a potential, unknown chamber — can then record particle tracks and discern cavities from denser regions." In late 2015, Egypt started radar scans of Tutankhamun's tomb in the Valley of the Kings in southern Egypt, after a British archaeologist theorised that Nefertiti was buried in a secret chamber there. Nicholas Reeves suggested that Tutankhamun's tomb was in fact Nefertiti's, and when the boy king died unexpectedly at a young age, he was rushed into her tomb's outer chamber. But Egyptologists have since differed on whether there is a secret chamber in the tomb and further analysis is expected.